Reducing transistor switching power; paper with superpowers; creating valley current. One of the great challenges in electronics has been to reduce power consumption during transistor switching operation. 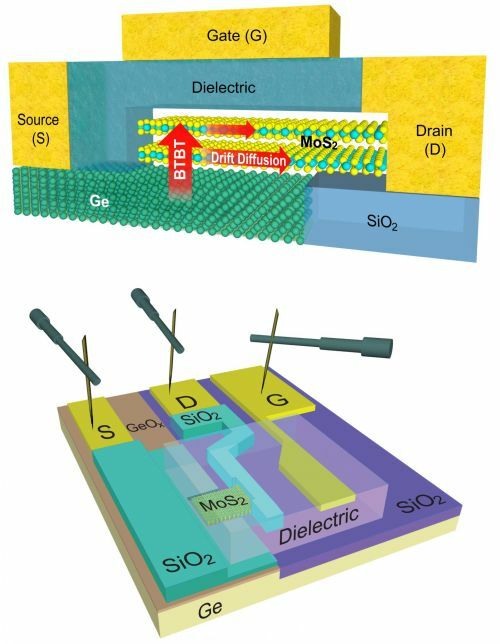 However, engineers at University of California, Santa Barbara, and Rice University demonstrated a new transistor that switches at only 0.1 volts and reduces power dissipation by over 90% compared to state-of-the-art MOSFETs. “The steepness of a transistor’s turn-on is characterized by a parameter known as the subthreshold swing, which cannot be lowered below a certain level in MOSFETs,” said Kaustav Banerjee, Professor of Electrical and Computer Engineering at UC Santa Barbara. A minimum gate voltage change of 60 millivolts at room temperature is required to change the current by a factor of ten in MOSFETs. In essence, the existing state of transistor technology limits the energy efficiency potential of digital circuits in general. The research group took a new approach to subverting this fundamental limitation. They employed the quantum mechanical phenomenon of band-to-band tunneling to design a tunnel field effect transistor (TFET) with sub-60mV per decade of subthreshold swing. “We restructured the transistor’s source to channel junction to filter out high energy electrons that can diffuse over the source/channel barrier even in the off state, thereby making the off state current negligibly small,” said Banerjee. The TFET designed by the team used molybdenum disulphide as the current-carrying channel placed over a highly doped germanium as the source electrode, which offered an ideal surface and thickness of only 1.3nm. “The crux of our idea is to combine 3D and 2D materials in a unique heterostructure, to achieve the best of both worlds. The matured doping technology of 3D structures is married to the ultra-thin nature and pristine interfaces of 2D layers to obtain an efficient quantum-mechanical tunneling barrier, which can be easily tuned by the gate,” commented Deblina Sarkar, lead author of the paper and PhD student. “We have engineered what is, at present, the thinnest-channel subthermionic transistor ever made,” said Banerjee. The atomically-thin and layered semiconducting channel tunnel FET (or ATLAS-TFET) is the only planar architecture TFET to achieve subthermionic subthreshold swing (~30 millivolts/decade at room temperature) over four decades of drain current, and the only one in any architecture to achieve so at an ultra-low drain-source voltage of 0.1V. Researchers at Linköping University in Sweden developed a new, papery material with the ability to store energy. 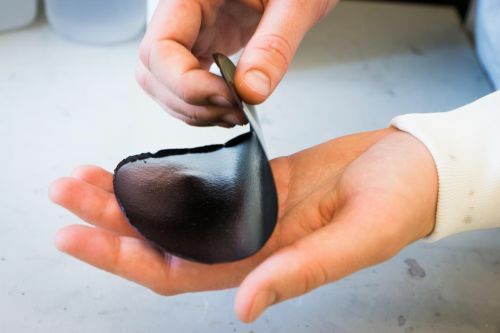 One sheet, 15 centimeters in diameter and a few tenths of a millimeter thick can store as much as 1 F, similar to supercapacitors currently on the market. The material can be recharged hundreds of times and each charge only takes a few seconds. “Thin films that function as capacitors have existed for some time. What we have done is to produce the material in three dimensions. We can produce thick sheets,” says Xavier Crispin, professor of organic electronics at Linköping. The material, which the researchers are calling “power paper,” looks and feels like a slightly plasticky paper and the researchers have amused themselves by using one piece to make an origami swan — which gives an indication of its strength. The structural foundation of the material is nanocellulose, cellulose fibers broken down as thin as 20nm in diameter using high-pressure water. An electrically charged polymer (PEDOT:PSS) in a water solution was added, which formed a thin coating around the fibers. “The covered fibers are in tangles, where the liquid in the spaces between them functions as an electrolyte,” explains Jesper Edberg, a doctoral student who conducted the experiments. The new cellulose-polymer material has set a world record in simultaneous conductivity for ions and electrons, which explains its exceptional capacity for energy storage. It also opens the door to continued development toward even higher capacity. Unlike the batteries and capacitors currently on the market, power paper is produced from simple materials – renewable cellulose and an easily available polymer. It is light in weight, it requires no dangerous chemicals or heavy metals and it is waterproof. Giving a boost to a future of “valleytronics,” researchers at the University of Tokyo demonstrated an electrically controllable valley current device that converts conventional electrical current to valley current, passes it through a long (3.5 micron) channel, then converts the valley current back into charge current that can be detected by a measurable voltage. The research group used a graphene bilayer sandwiched between two insulator layers, with the whole device sandwiched between two conducting layers or ‘gates’, allowing for the control of valley.